American sprinter Tori Bowie delivered a major upset in the Women's 100m Finals on Sunday, giving the U.S. a male-female 100m sweep. Twenty-six-year-old former long jumper Tori Bowie sprinted to victory with a time of 10.85 in London on Sunday, lurching her body over the finish line just one-hundredth of a second before second-place finisher Marie-Josée Ta Lou of the Ivory Coast. The crazy lean caused Bowie to lose her balance and fall just past the finish line. When she shook off the tumble and stood up again to see herself listed as the victor, she collapsed back onto the track in amazement before welcoming hugs from her competitors. Elaine Thompson of Jamaica placed fifth, despite critics’ expectations that she would win. 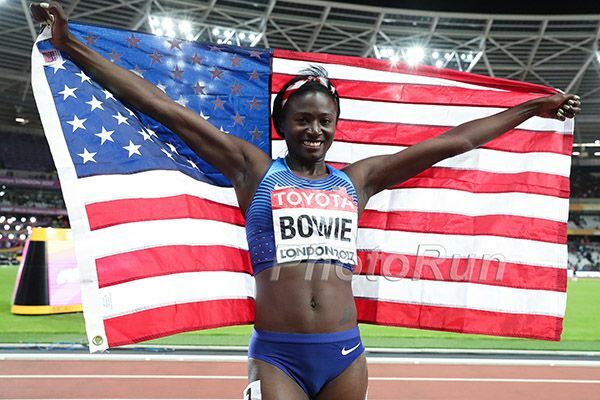 Bowie’s surprise upset came one day after fellow American sprinter Justin Gatlin created a similar stir by beating Usain Bolt in the men’s 100m finals. During the 100m finals in Rio last year, Bowie came in second to Thompson, who also won the gold medal for the 200m. 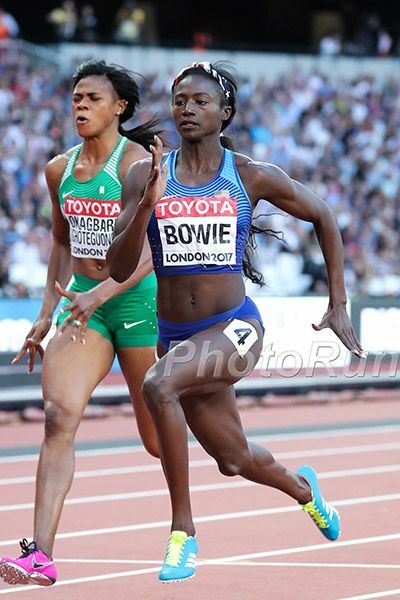 Before the gun launched the women’s 100m finals, commentators considered Bowie’s potential to make the podium, musing, “Every time she takes the track, she seems to get better.” Bowie, who is also entered in the 200m, will face that test throughout the week as she competes for a spot in the 200m finals on Friday, August 11.